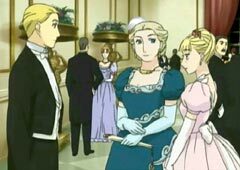 Victorian Britain comes alive Jane Austen style in an anime that's sure to make you feel the love--Victorian Romance Emma. 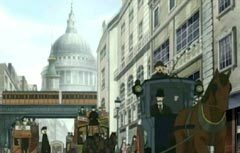 Studio Pierrot brings to us this summer Eikoku Koi Monogatari Emma (Victorian Romance Emma), a twelve episode historical romance/slice-of-life drama set in Victorian era London that is based on the manga of the same name. From the opening credits, we are immersed inside a world divided, where the lively commercial London of the streets contrasts with the ballroom dancing of the upper class. The opening song is an upbeat composition of piano, violin and drums, entitled "Silhouette of a Breeze." The ending song, "Menuet for EMMA" by Tokyo Recorder Orchestra, runs merrily, while sepia-toned still life images run alongside the closing credits. 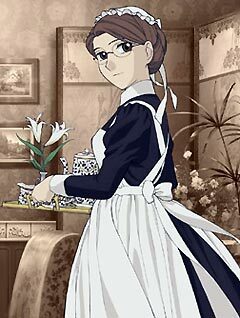 All of the music in Victorian Romance Emma serves to enrich the period mood of the anime. Music director Ryo Kunihiko, best known for his work on Twelve Kingdoms, should be praised for such an excellent job. The nineteen-track OST, "Silhouette of a Breeze," is currently available, and it would definitely make a welcome addition to any music lover's collection. The plot of Victorian Romance Emma should be familiar to anyone who has read a Victorian or Restoration era novel. William Jounes has fallen in love with Emma. 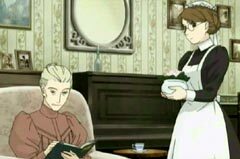 However, he is a member of the gentry (the status between upper middle class and nobility) and his family's heir, and she is merely a maid, not even employed by his family. In the novels, this would mean either elevating Emma's social status with a secret noble heritage, or William disowning himself from his wealthy family, thus lowering himself to Emma's social rank. Victorian Romance Emma, however, chooses to focus more on examining social hierarchy and the division of Britain into two separate worlds than on satisfactorily resolving the love affair. The situation is timeless, yet in Victorian Romance Emma, we see the class-crossed lovers act overtly with honesty and dignity; no elaborate disguises or schemes for a midnight rendezvous here. In fact, Emma's employer and William's former governess, Kelly Stowner encourages their affair, believing that love can overcome even obstacles as strong as society. However, she is the exception to the norm. William's father is strongly opposed, as are some of the Jounes servants. William's siblings, Arthur, Grace, Vivi and Colin see it as social suicide and willfully putting the family into jeopardy. Emma and William, however, are both well aware of the turmoil that their relationship is causing for themselves and the people around them, and this is a refreshing sight to see in both romantic anime and literature. The contrast between an acceptable wife-to-be and an unacceptable one is illustrated in Eleanor Campbell, a beautiful young noblewoman who has newly "come out" into society as a marriageable woman. It would be very easy to cast her as the villain, yet we always have a certain amount of sympathy towards her, as it is quite clear that she likes William, even though he does not return her affection. Eleanor is very immature emotionally, which gives her character credibility, as realistically speaking, Eleanor would be around fifteen years old. The majority of the relationship between William and Eleanor is orchestrated by their respective families, as wouldn't it be nice if the children married? The House of Jounes would gain noble status, thus strengthening their social status, while the House of Campbell would gain much-needed wealth in order to maintain their lavish lifestyle. 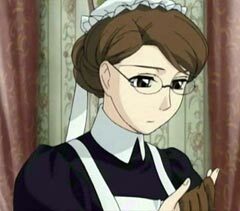 It would be good to point out that Emma is not pretty by any means; in fact, she is very plain and wears glasses (not a fashionable accessory at all in this time period). What seems to attract William is her kindness and good manners, qualities which William possesses himself. Although she is a beautiful person inside, it's clear why everyone other than William would favor the match-up between William and Eleanor. Early on in the series, we meet Hakim Atawari. An Indian royal prince, Hakim comes to Britain to visit his old school friend William, along with his entourage of harem girls and elephants. An exotic character, he is able to breech the lines of custom and propriety in Victorian society to encourage William in his pursuit of Emma, to follow his heart over tradition and expectation. Hakim also adds some comic elements to the show, but his main role is that of the wingman, of which he does an excellent job. The voice acting is solid in this production; however, it feels peculiar, hearing Japanese coming from the mouths of clearly English characters -- Victorian era English at that. However, soon the voices blend in seamlessly, matching their characters. Emma is voiced by veteran Yumi Touma, the voice behind such notable characters as Urd from Ah! My Goddess, Yui from Fushigi Yuugi, and Deedlit from Record of Lodoss War. William, on the other hand, is voiced by the relatively unknown Tokuyoshi Kawashima, whose only previous work of note is Kenji Hatano in Monkey Turn. Sanae Kobayashi and Yuuji Ueda, both with a long list of former seiyuu roles, lend support as Eleanor and Hakim. Director Kobayashi Tuneo (Twelve Kingdoms, Midori no Hibi) chose excellent talent to back up this masterpiece of storytelling. We will look forward to seeing future projects from this talented ensemble. Some people will feel frustrated by the slow pace of the show. Emma wears a blank face frequently, and she rarely speaks her mind, while William is a study in hesitation and inaction. It is only when time seems to be running out that our lovers start to act on their feelings. The ending will also leave many feeling unfulfilled, as it is very open-ended. Perhaps this is intentional, as the manga is unfinished, or perhaps they merely wished to break the tradition of happy endings for the Victorian romance novel. The anime version maintains the emphasis on historical accuracy that is found in the manga, to the point where a companion reference guide has been published to explain obscure details that the average reader would not be familiar with. Locations such as Mudie's, an influential subscription lending library, and the Crystal Palace are taken straight from reality, as well as Emma's refusal to accept William's gift of a parasol as too extravagant for a working girl. Emma's impovished background, shown during flashbacks, additionally serves as a good lesson on how life was for the majority of Britain, especially for girls. There are so many nonverbal cues in Victorian Romance Emma that familiarity with Victorian customs, or at least Victorian literary customs is almost required. There is no grand decoration of love between Emma and William. Throughout the series, they only kiss once. Body language and actions consist of much of the dialogue early in the series, so viewers will need to pay attention. The animation also stays true to Kaoru Mori's vision in the manga, published monthly in Comic Beam, and condensed into five volumes. The manga is drawn in a very detailed pen and ink style, invocative of the style of late nineteenth century illustrations. Some line detail is lost in the process from paper to animation; faces are rather simplified, but it still feels very personal and intense. Studio Pierrot has something of a reputation for excellent storytelling with a loss in animation quality. Victorian Romance Emma heavily uses pastels, giving the series a soft tone that will be familiar to viewers of Haibane Renmei. This effect works well in dividing the two Londons: the working class looks washed-out and plain, while the gentry appear with a glow of superiority. It also adds a layer of realism to the foggy world of Victorian London. 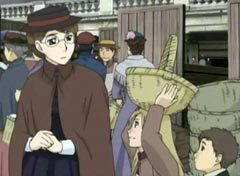 If you enjoy Haibane Renmei, Honey and Clover and other slow-paced anime with a focus on the mundane, then Victorian Romance Emma is tailor-made for you. Its rich atmosphere will draw you in, leaving you wanting more.